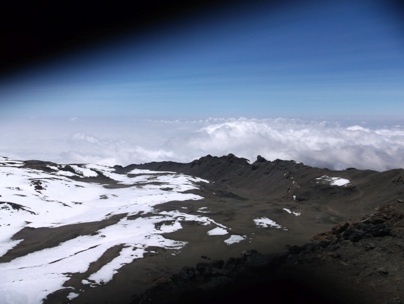 I still can’t quite believe that I reached the summit of Mount Kilimanjaro, Africa’s highest point, the world’s tallest freestanding mountain at a height of 5895 metres which stands taller than the base camp of Mount Everest. Talking about my time in Africa is something I find really difficult, simply because it’s nearly impossible to explain exactly what it was like out there. Trying to give an explanation that does the scenery and emotional rollercoaster justice is really very difficult. When I returned home and people asked after my trip, all I could say was “It was amazing, the best thing I’ve ever done” because unless you have a couple of hours spare there’s not more that can be said! The 2 weeks were completely overwhelming, stressful and gruelling but absolutely fantastic at the same time. When people ask me if I would do it all over again, I’m not sure I would – I don’t need to! But I’d definitely do something similar again, I think The Great Wall of China is my next adventure…I’ll give it some time before I put my parents through all of the trauma again, not to mention the finances! During my time in Africa I wrote a journal so that every detail I could manage was documented for my memories. 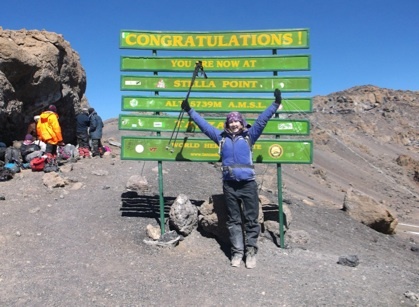 I’m so pleased I did this because by the time I had been to the Orphanage, Kilimanjaro felt like months ago. 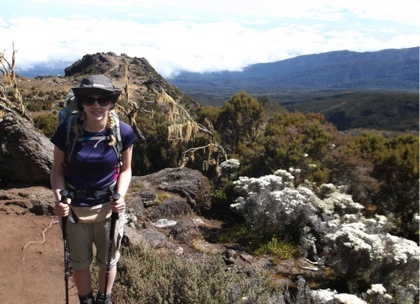 Writing this article I have refreshed my mind by reading it back for the first time and it’s safe to say I’ve got the post-Kili-blues all over again! I was in a team of 22 students, 3 boys and 19 girls. I knew 2 people relatively well, but really it felt like starting out a completely independent adventure which was pretty nerve racking! In this kind of environment you can’t avoid bonding with people and forming memories and friendships that will last a lifetime. As you can imagine going to the toilet, attempting personal hygiene and having moments of mental weakness are all quite intimate things to be sharing with strangers – safe to say it’ll always be quite a unique friendship that we share! I’ve been lucky enough to go abroad quite a lot in my life so far, but I’ve never made it across to Africa before. Stepping off the plane into Nairobi airport after coming through Heathrow was like stepping back in time, it is quite literally a completely different world.. All of the clichés you’d associate became a reality for me to see and it was really quite overwhelming throughout my trip. The organisation are quite sneaky about how they drive you towards the mountain because you can never actually see it (which sounds ridiculous considering the sheer size of it) but Kilimanjaro has its own weather surrounding it, and so the way in to the national park was shrouded in heavy cloud and fog so we couldn’t see what we were in for! It wasn’t until we made it down the other side and were driving away from it that we turned back and had universal intake of breath to see that we had just been to top of this giant. If I’d have seen it before I don’t think I would have been mentally prepared at all. 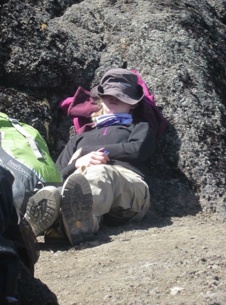 Nothing about my trip was what I had envisaged – I don’t really know what I was expecting but, it wasn’t that. The terrain of the mountain changed about every half an hour and We walked through 7 different eco-systems , it was quite surreal. Every day I reminded myself to stop and take 5 minutes to stand and take in my surroundings because mostly you find yourself looking at your feet and trying to find the best footings as well as telling yourself to just keep putting one foot in front of the other. 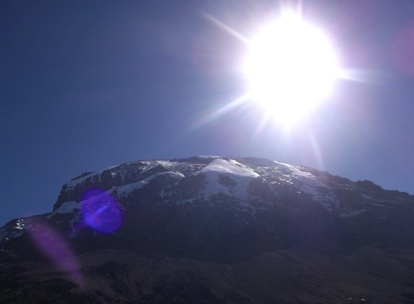 There were several African phrases that became commonplace on the mountain, my favourite being ‘Hakuna Matata’ (yes, people actually say this!) 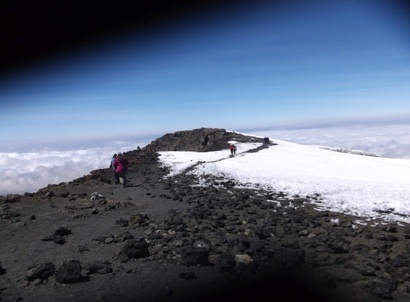 Pole pole (po-ley) meaning ‘slowly, slowly’ was the one used the most, because Kilimanjaro has to be climbed over 6 days in order to help your body adjust to the climate change, and the change in altitude. There were several songs that we learnt about the mountain as well which kept spirits high. Whenever anybody began to struggle one of the porters would sing to them and it became such a comfort. 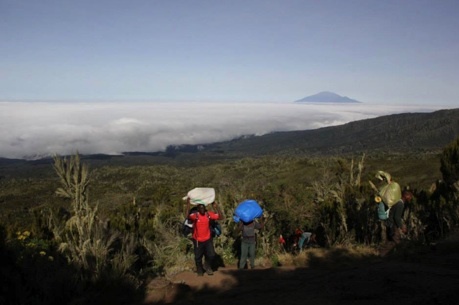 The porters were absolutely amazing, carrying our tents and all of the food up. During the climb it was somebody’s Birthday and somehow they baked a cake on the side of the mountain! Absolutely incredible, iced and decorated as well! The food was absolutely amazing, every night we would have three courses and the porters insisted we ate plenty. 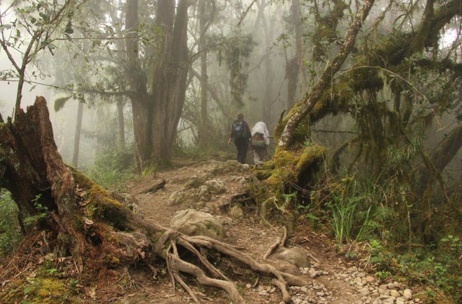 One of the symptoms of altitude sickness is a lack of appetitie but walking for at least 10 hours a day it is absolutely vital that you eat. 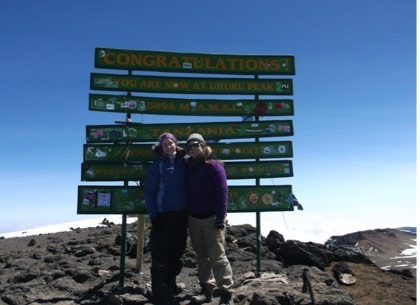 Although we adored the porters and they truly became like our family on the mountain we very quickly learnt that African time is quite frankly, an absolute joke! We would ask them ‘how long until we stop for lunch’ and they would say ‘Only another 30 minutes’….3 hours later we would sit down and eat. They told us that in Africa, if you are visiting for a business meeting and are running late, they will only worry about you when you are more than 2 days late because the public transport is so bad and everything is at such a slow pace! It is great to get away from the rushed, self absorbed Western lifestyle but slowing down was at times frustrating and a really difficult adjustment to make. Looking back at summit night is like reliving a nightmare and I wish I was exaggerating. It was the hardest 24 hours I’ve ever endured, and I can’t imagine anything ever comparing! In the morning I seemed to hit my ‘wall’ I came over really faint and couldn’t walk, but with the help from my friends and porters I was feeling better within the hour. 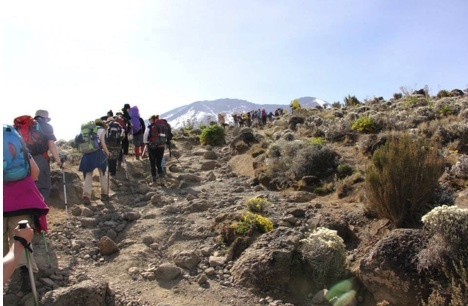 We had to climb barranco wall which took a long time and was really physically hard, later on we had a valley to cross which was like a black ski slope with dust and rocks,. Getting up the other side was so steep and we were all so exhausted – not being able to see the end in sight was very demoralising. Eventually we made it to camp and then had three hours sleep. I assure you, three hours is nowhere near enough to climb a mountain on. Walking in the dark across the versatile terrain of the mountain is bad enough, but physically rock climbing by head torch was less than ideal to say the least. 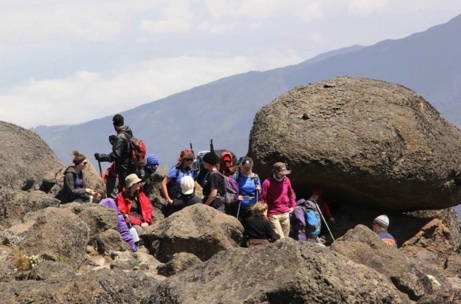 As we started the trek people were literally dropping like flies, some from suspected hypothermia, others altitude sickness. The lack of altititude and the height was much more prominent. My chest was tight and I had a constant dull head ache throughout. Around 5am I hit my low. Being forced to walk on, helpless to my friends that lay crumpled on the ground was so difficult. Walking alone and having only my own thoughts definitely took its toll. I’m one of three that carried my daysack the whole way up, others had a porter that helped pull them up. I’m both happy and sad that I didn’t need the extra support, although at times it really felt like I did. I finally cried. It took the whole week of putting on a brave face and grin and bearing it all. When we took 5 minutes to rest and drink our water (that had turned to ice from the -25 degrees!) I remember sitting down on the side of this glorious mountain, looking out above the clouds to the horizon just starting to break through. Looking across the skyline, it was something that completely overwhelmed me. It was a moment of realisation, a sudden appreciation for where I was and that I would never have that moment again. All I could do was cry! Getting to Stella Point (the top of the mountain) I seemed to lose the inspiration, I just needed it to be over. We started walking at 1am and we reached Stella at 10am. The last half an hour I was ready to give up. It would have been so easy to just sit down and never get back up, but somehow I crawled my way up. 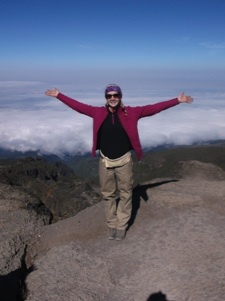 From Stella we then had another hour of (so-called) flat walking to Uhuru Peak, the highest point in Africa. Only a few of us went the extra hour, it felt like another 10 hours. At this height it was bitter -25 degrees with furious winds, surrounded by snow and with such little oxygen. I recall walking two paces and having to stop to gasp for air. I was falling asleep standing up in between paces. I’ve never felt such intense exhaustion in my life. It doesn’t feel like I was there and I wish I hadn’t been so miserable, I couldn’t fully enjoy it but after a lonely, gruelling walk on practically no sleep, you can understand! I regret not taking more pictures at the top but I just wasn’t functioning. Only 3 out of 22 didn’t make it to the top. Believe it or not, getting down was so much worse! Using a completely new set of muscles, and the pressure on my knees has given me grief for weeks afterwards. I realise I’ve made it sound like hell on Earth, and at times, it really felt like that, but, we had such fun every day I laughed until I cried. Nothing will ever compare to this completely unique experience I’ve had. It was such an adventure and I smile every time I think of it. We got back to the hotel at 6pm and had to leave for a ten hour journey to the Orphanage at 4am. 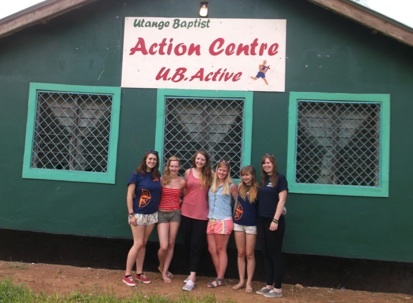 There was absolutely no recovery time and that made visiting Utange village so much harder than it already was. As we drove through Mombasa to Utange, the change was pretty drastic. As you got closer to the smaller villages the ‘real’ Africa as opposed to the touristy one, really started to settle in. Cement buildings turned into mud huts and shacks. Wherever we drove because we’re white people were just amazed to see us and would shout ‘Muzungu’ meaning white person. Everywhere we walked or drove we were treated like celebrities because obviously we are white and therefore the consensus is that we’ve got money. 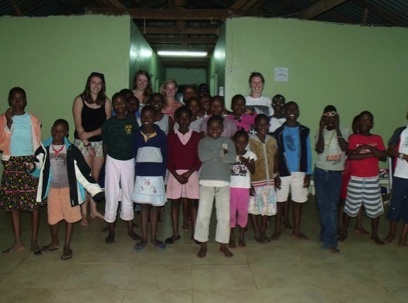 The Orphanage that we visited has saved 24 AIDS orphans and they live in a place called Casuarina House. There are 13 boys and 11 girls. The Foundation started in 2006 when a lady called Debbie turned her whole life upside down in order to rescue these children. 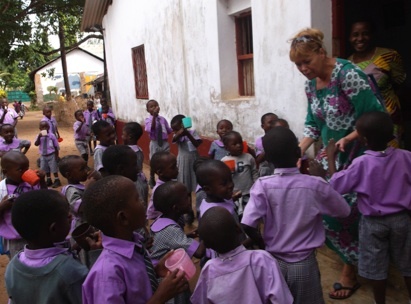 Not only has she fed clothed and given these 24 children a home, she does as much as she can for the rest of the village as well. Every Saturday there is a feeding programme where 500 orphans come to receive a cupful of food so that they have at least one hot meal a week. You see children that are only 3 years old coming and saving half of their tiny portion just so they have food the next day. A lot of children are taken in by the women in the village so they have shelter, but these women struggle to find the money to feed themselves, so often they don’t feed the orphans because they physically can’t do it. Debbie’s program provides a small bag of maize flour for the children to take back as a sort of rent payment/thanks to the family. Hearing about all of this was pretty hard especially when we were as tired as we were and I found that I had to keep reminding myself that actually this is a really positive place and at least there is something here even if it is only helping 24 out of the 500 that come every week. It’s one of those things that needs to be done in baby steps because you physically can’t give everything to everyone as much as you really want to. The orphanage is connected to Utange Baptist Primary School and where we were staying was basically on the school grounds so we’d have children run over to the house to play with us all the time, it was very much non-stop and it was really good that we were a part of the community straight away. We took a tour around the school and every single class stood and sang for us. Their head teacher would ask them if they’re happy and I remember one little boy answering as she asked him why he was happy and he said ‘because he had learnt well’ and it was such a genuine and sincere reply it proves just how much these children cherish their education. 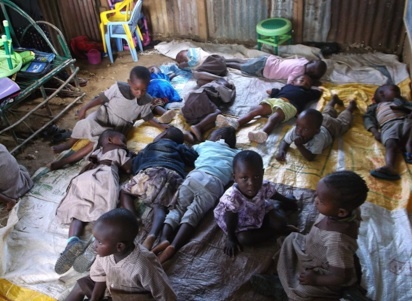 If these children weren’t sponsored to go to this private school they wouldn’t be able to go to school, They would have to work, even at 5 years old. In some cases boys as young as five years old that can’t afford education are expected to take on the fatherly role and work to put food on the table. That alone really puts my everyday first world problems into perspective. To go to public school is around £100 so most sponsors send them to public school where there will be roughly 150 pupils in one class with one teacher. I’m not sure that a standard of education that poor is really worth the £100. But, people that sponsor rarely know. For example one German lady sponsors a lot of the Casuarina children and one called Monica the second youngest couldn’t talk when she was taken in because she was so under nourished and starving. 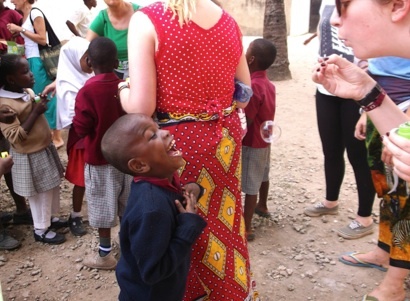 Now she’s in school and she can speak Swahili and some English. She’s moved up from the bottom of the class to second bottom which is amazing. Her sponsor was threatening to pull the money because she wasn’t performing quickly enough. I think to fully understand, as a sponsor you need to really see the children and understand the conditions that they’ve come from and the remarkable work that is being done. If you ever have the opportunity to experience this entirely different and extreme culture change, without a doubt, go, because it will be life-changing, It is unavoidable, since I’ve been back I can’t stop thinking about the whole experience. I am incredibly grateful to everyone that has supported me in my adventure. As you can see, I had the time of my life and as awful as moments were, they were absolutely worth it. I’d like to reiterate that every single penny of the £2,900 donated went to Meningitis Research Foundation an absolutely fantastic cause. 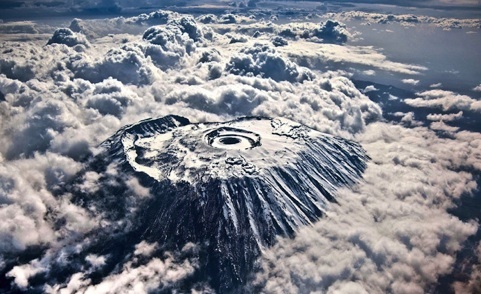 This entry was posted in Blog and tagged Kilimanjaro. Bookmark the permalink.